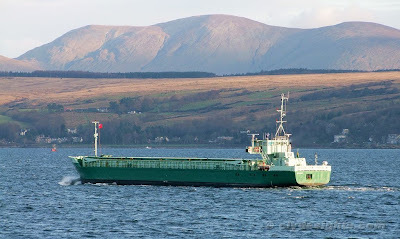 There have not been many ships visiting the Holy Loch recently, but on Thursday morning the coaster SNOWLARK was seen heading for Sandbank to load a cargo of timber for export to Youghal. SNOWLARK, whose last port had been Warrenpoint, was built in 1984, and was originally named MOSA. In 1998 she was renamed RMS WALSUM, later becoming RMS SNOWLARK in 2005, and in August 2008 the prefix to her name was dropped. At 1,555 tonnes deadweight, she is 74.85 metres in length. She is now owned by an Estonian company, and flies the St Vincent & The Grenadines flag.